LONDON - Violence and looting raged across London and spread to three other major British cities on Tuesday, as authorities struggled to contain the country's most serious unrest since race riots set the capital ablaze in the 1980s. In London, a third straight night of disorder saw buildings, vehicles and garbage dumps set alight, stores looted and police officers pelted with bottles and fireworks, as groups of young people rampaged through neighborhoods. It was an unwelcome reminder of London's volatility for leaders organizing the 2012 Summer Olympics in less than a year. As authorities struggled to keep pace with unrest unfolding at flashpoints across London, the violence spread to the central city of Birmingham, the western city of Bristol and the northwestern city of Liverpool. Prime Minister David Cameron cut short his summer vacation in Italy and was headed home for a meeting of the national crisis committee on Tuesday morning. The riots appeared to have little unifying cause - though some involved in the violence claimed to be motivated by government cuts to public spending. The government was aiming to toughen its stance against the violence, as some communities complained that stretched police were struggling to contain the unrest with rioters plundering from stores at will, menacing shocked customers at restaurants and attempting to invade homes. Stores shut early across London, fearful of violence and looting. Violence first broke out late Saturday in London's northern Tottenham district when a peaceful protest over the fatal police shooting of Mark Duggan, a 29-year-old father of four who was gunned down in disputed circumstances Thursday, turned violent. Two police cars and a double-decker bus were set alight, stores were looted and several buildings along Tottenham's main street - five miles (eight kilometers) from the site of the 2012 Olympics - were reduced to smoldering shells. Duggan's death stirred old animosities and racial tensions which prompted riots in the 1980s, despite efforts by London police to build better relations with the city's ethnic communities after high-profile cases of racism in recent decades. As the unrest spread, some pointed to rising social tensions in Britain as the government slashes 80 billion pounds ($130 billion) from public spending by 2015 to reduce the huge deficit, swollen after the country spent billions bailing out its foundering banks. In south London, a massive blaze swept through a 100-year-old family run furniture store in the borough of Croydon and sent thick plumes of smoke into the air, forcing nearby homes to be evacuated. Police also confirmed they were investigating a nonfatal shooting in Croydon, but were unable to say whether the incident was linked to the chaos. Dozens of people attacked shops in Birmingham's main retail district, and clashed with police in Liverpool and Bristol - spreading the chaos beyond London for the first time. In the Hackney area of east London, hundreds of youths attacked shops and set fire to cars, leaving a trail of burning trash and shattered glass. Looters ducked into a small convenience store as the blackened shells of two cars burned nearby, filling plastic shopping bags with alcohol, cigarettes, candy and toilet paper. Police acknowledged Tuesday that major new bouts of violence had flared in at least five locations, badly stretching their resources. Many more neighborhoods saw mobs vandalize commercial streets or break into buildings - some acting with virtual impunity, as authorities struggled to deploy officers to every scene of unrest. "The violence we have seen is simply inexcusable. Ordinary people have had their lives turned upside down by this mindless thuggery," police commander Christine Jones said, as she confirmed that 239 people had been arrested and 45 people charged with offenses. Though the unrest escalated through Sunday as disorder spread among neighboring areas, the crisis worsened Monday - with violence touching areas in the east and south of London previously untroubled by the chaos. "There is significant disorder breaking out in a number of our communities across London," Tim Godwin, the acting London police commissioner said Monday, acknowledging that 1,700 extra officers had been deployed across London, but were struggling to halt the unrest. Some residents called for police to deploy water cannons to disperse rioters, or call on the military for support. About 100 young people clashed early Tuesday with police in the Camden and Chalk Farm areas of north London, while others tore through a department store in the busy south London suburb of Clapham. The small groups of youths - most with their heads and faces covered - used SMS messages, instant messaging on BlackBerry smartphones and social media such as Twitter to coordinate their attacks and stay ahead of the police. Once the preserve of businesspeople, BlackBerry handsets are popular with teenagers, thanks to their free, fast instant messaging system. Blackberry's manufacturer, Research in Motion, said in a statement that it was assisting authorities in their investigation and "feel for those impacted by the riots in London." Police were also monitoring Twitter, and warned that those who posted messages inciting the violence could face arrest. In the Peckham district of south London, where a building was set ablaze along with a bus - which was not carrying passengers - onlookers said the scene resembled a conflict zone. Cars were torched in nearby Lewisham, and shops looted in south London's Clapham district. "There's been tension for a long time. The kids aren't happy. 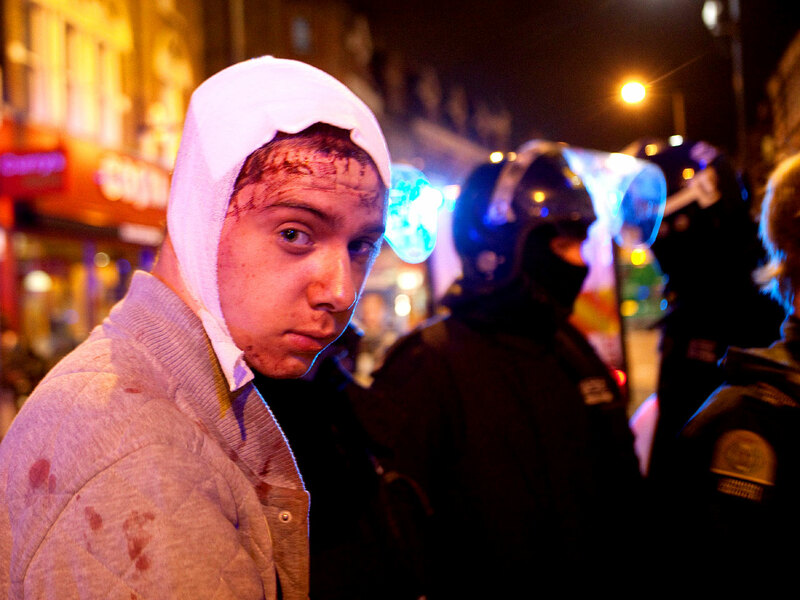 They hate the police," said Matthew Yeoland, a 43-year-old teacher watching the unrest in Peckham. "It's like a war zone and the police weren't doing anything. There were too many people and not enough police." Police said Duggan was shot dead last week when police from Operation Trident - the unit that investigates gun crime in the black community - stopped a cab he was riding in. The Independent Police Complaints Commission, which is investigating the shooting, said a "non-police firearm" was recovered at the scene, and media reports said a bullet had been found in an officer's radio. However, the Guardian newspaper reported that the bullet in the radio was police-issue, indicating Duggan may not have fired at the officer. Duggan's partner, Semone Wilson, insisted Monday that her fiance was not connected to gang violence and urged police to offer more information about his death. But she said the riots appeared to be no longer linked to the initial protests. "It got out of hand. It's not connected to this anymore. This is out of control," she said. Many Tottenham residents claimed that the looting was the work of greedy youths - rather than fueled by anti-police sentiments. "It's nothing to do with the man who was shot, is it?" said 37-year-old Marcia Simmons, who has lived in the diverse and gritty north London neighborhood all her life. "A lot of youths ... heard there was a protest and joined in. Others used it as an opportunity to kit themselves out, didn't they, with shoes and T-shirts and everything." The past year has seen mass protests against the tripling of student tuition fees and cuts to public sector pensions. In November, December and March, small groups broke away from large marches in London to loot. In the most notorious episode, rioters attacked a Rolls-Royce carrying Prince Charles and his wife Camilla to a charity concert. However, the full impact of spending cuts has yet to be felt and the unemployment rate is stable - although it remains highest among youth, especially in areas like Tottenham, Hackney and Croydon. Some residents insisted that joblessness was not to blame. "It's just an excuse for the young ones to come and rob shops," said Brixton resident Marilyn Moseley, 49. Godwin urged communities to help clear the streets of people, and called on families to contact their children and ensure that they were not involved in the chaos. An 11-year-old boy was charged with burglary by police, and at least 100 of those arrested were aged 21 or younger. About 35 police officers had been injured in the violence, police said. Home Secretary Theresa May, the Cabinet minister responsible for policing, and London Mayor Boris Johnson also cut short summer vacations in an attempt to deal with the crisis. Police in the city of Birmingham, 120 miles (195 kilometers) north of London, confirmed that officers had arrested 35 people amid disorder across the city center, where shops were being vandalized. In Bristol, police urged residents to avoid the city center after 150 rioters went on the rampage. In the south London neighborhood of Brixton - the scene of riots in the 1980s and 1990s - youths smashed windows, attacked a police car, set fire to garbage bins and stole video games, sportswear and other goods from stores on Sunday night. Like Brixton, Tottenham is an impoverished area with an ethnically diverse population, a large black community and a history of unrest. Tottenham was the site of the 1985 Broadwater Farm riots, a series of clashes that led to the fatal stabbing of a police officer and the wounding of nearly 60 others - and underscored tensions between London police and the capital's black community. West Ham, a football team in east London, confirmed it had canceled a match planned for Tuesday and said police had asked for "all major public events" to be postponed. However, the national Football Association insisted that a scheduled international friendly match between England and the Netherlands would go ahead at Wembley Stadium on Wednesday. The International Olympic Committee said it had confidence in British authorities. "Security at the Olympic Games is a top priority for the IOC," spokesman Mark Adams said.